14k Gold San Marco bracelet. This wide version of the classic bracelet measures 14mm in width and 7 inches in length OR an 8 inch. Bracelet weighs an amazing 31.71grams. It's hollow with a closed back. Bracelet design secured with a fold over catch. 14k Gold Fancy Textured and Polished link Bracelet. Beautiful Italian created bracelet measures 10mm wide by 7 1/2 inches in length. This design weighs about 13grams and is secured with a fold over catch. 14k Gold Fancy Wheat Bracelet. 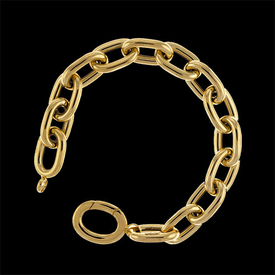 Gorgeous Italian Made 14k yellow gold polished fancy design bracelet measures 6.5mm wide and is 7 1/2 inches in length. Bracelet is secured with a large spring ring clasp. Beautiful 14k Gold Figaro bracelet. Bracelet measures 8.75mm wide and is Italian made. Our price listed is for the 8 inch length and weighs about 12.70grams. This handmade classic bracelet is Rhodium plated for a bright finish. Secured with a lobster clasp, you'll love this Classic Figaro Bracelet. Bracelet is part of our Lifetime Guarantee collection. Gorgeous 14k yellow gold flat edge style womens bracelet. Italian artistry and craftsmanship complement bold styling and elegance in this bracelet design. This bracelet is 7mm wide and 7 3/4 inch in length. A beautiful but hollow design weighs about 7.3grams. Part of our "Guaranteed for Life" jewelry collection. If this bracelet is damaged in anyway we will exchange or replace it period. Stylish 14k White gold Beveled Curb bracelet. This finely crafted Italian made bracelet measures 7mm wide and 8 inches in length. Gram weight is about 10.35grams. Bracelet is part of our Lifetime Guarantee collection and Rhodium plated for a bright white finish. This curb bracelet is handmade and features a lobster claw clasp. Beautiful 14k Gold Rolo style chain. Classic Rolo design measures 4mm wide and is available in a variety of lengths including bracelet lengths. This Rolo features an infinity style lobster clasp. Fancy 14k yellow gold Italian bracelet. This design measures 5mm wide and 7 1/2 inches in length. Now available in 14k yellow or white gold. 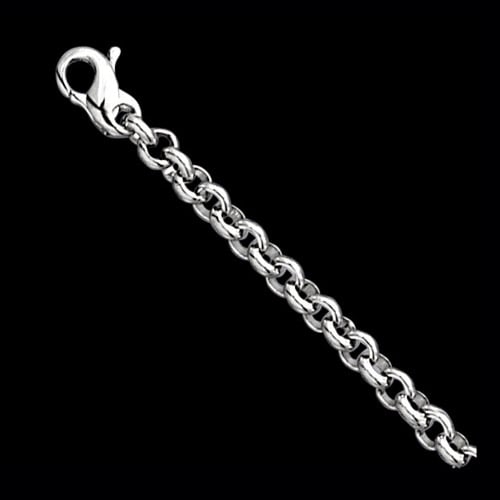 Italian crafted bracelet weighs 7.2 grams. Features a lobster clasp. Stunning 14k yellow gold fashion bracelet. Ladies design bracelet measures 9mm in width by 7 1/2 inches in length and weighs aprox. 7.74grams. An Italian made design secured with a large spring ring style clasp. 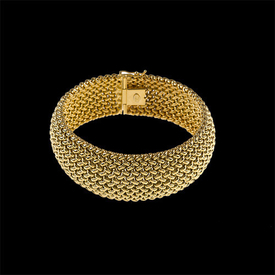 Gorgeous 14k yellow gold mesh design wide bracelet. This bracelet measures 22mm wide and weighs about 46grams. An incredible Italian made statement bracelet available in a 7 1/2 inch, email to custom order alternate lengths. Gold bracelet is secured with a box with tongue and safety clasp. Textured 14k two tone gold bracelet. Italian craftsmanship and artistry complement elegance and bold styling in this bracelet design. This bracelet is 7mm wide and 7 1/2 inch in length. A beautiful but hollow design weighs about 7.85grams. Part of our "Guaranteed for Life" jewelry collection. If this bracelet is damaged in anyway we will exchange or replace it period. Luxurious 14k Gold Figaro bracelet. Bracelet measures 7.25mm wide and is Italian made. Our price listed is for the 8 inch length and weighs about 10grams. This bracelet is hand made and Rhodium plated for a bright finish. Bracelet is part of our Lifetime Guarantee collection. Pretty 14k White or Yellow gold satin and polished bracelet. This fancy design bracelet measures 4mm in width and is 7 1/4 long. Secured with a fancy lobster clasp. Part of our Lifetime Guarantee collection. If this item breaks or is damaged for ANY reason simply send it back and we'll replace it!!! If the item is no longer available we will replace with similar same value item. How can you beat that? A beautiful bracelet, guaranteed for life. 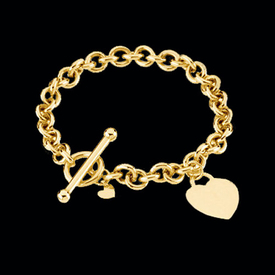 Stylish 14k yellow gold Rolo bracelet with a dangle heart. This lovely bracelet measures 6mm in width and is 7 inches in length. Bracelet features a very fashionable toggle design clasp with a little heart dangle and a larger engraveable heart dangle on the bracelet. This ladies gold bracelet weighs about 8.9grams. Stylish 14k two-toned fancy bracelet. An incredible Italian made bracelet 8 inches in length weighing a substantial 17.96grams. Bracelet measures 10mm in width and is secured with a lobster style clasp. Part of our Lifetime Guarantee collection. If this item breaks or is damaged for ANY reason simply send it back and we'll replace it!!! If the item is no longer available we will replace with similar same value item. How can you beat that? A beautiful bracelet, guaranteed for life. Stunning 14k yellow gold bold bracelet. You'll enjoy this brilliant ladies large link design bracelet everyday or for that special event. Bracelet is available in a 8 1/4 inch length and is secured on your wrist with a secure clasp that blends in perfectly with the design. 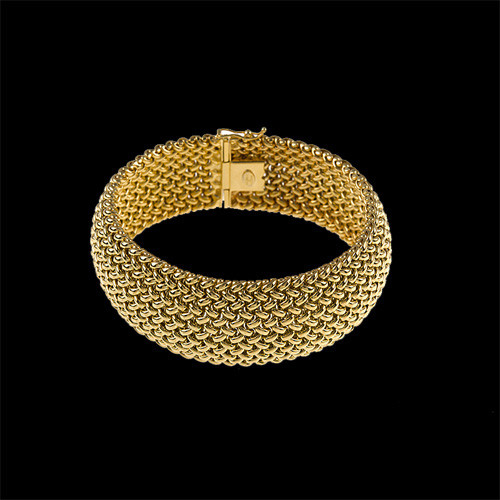 Feel the luxury of our bold gold bracelet, you'll feel like a princess. 14k Gold small charm bracelet available in a 7 length. This bracelet measures 4.5mm wide and is available in 14k Yellow or White gold. Casual everyday design weighs 7.30grams. 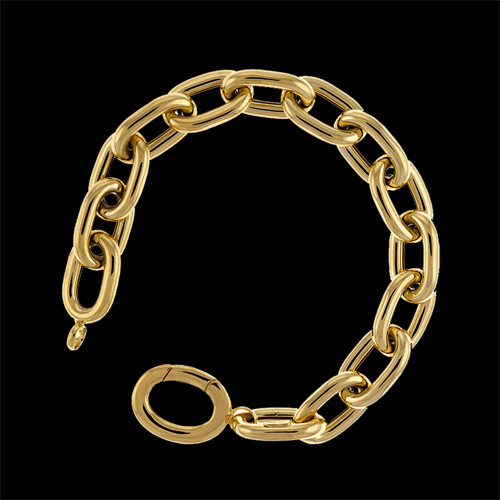 Stylish 14kt yellow gold San Marco style bracelet. Bracelet measures 8mm in width and 7 inches in length. 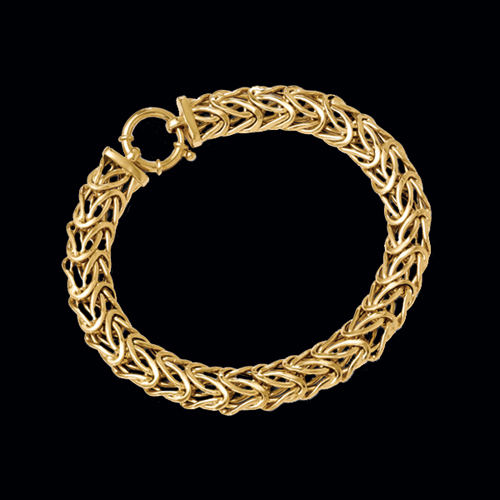 This gold bracelet is secured with a lobster clasp and weighs about 13.5grams. Gold goes with everything and this gold bracelet is no exception. Wear it with your favorite jeans or that special dress you've been saving for a special occasion. This is a hollow bracelet. 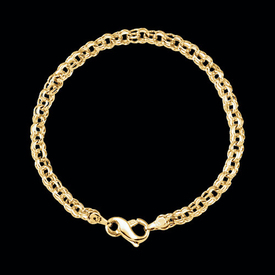 Beautiful 14kt yellow gold in a double link design creates this stunning bracelet. 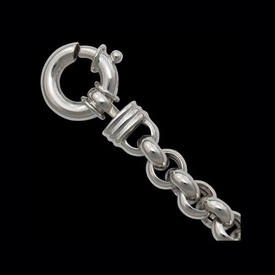 This Italian made bracelet is readily available in a 7 or 7 1/2 inch length. 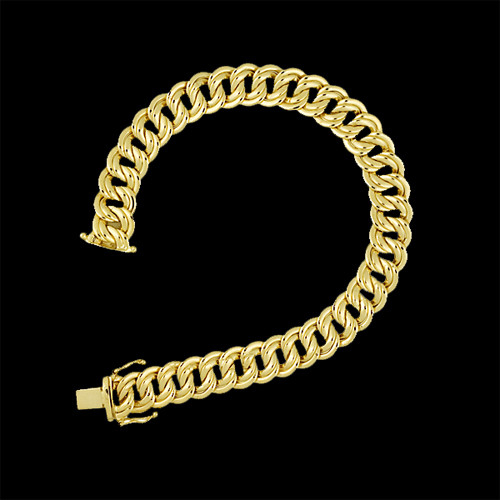 Gold bracelet measures 10 mm in width and is secured with a box with tongue and safety clasp. The English word "bracelet" comes from the Latin word "brachium," which means arm. It is a loop of material closely related to chains or straps worn on the wrist or forearm. Since ancient times, bracelets have served as decorative jewelry, along with anklets, earrings, necklaces, and rings. In many societies, gold bracelets are a sign of wealth and stature. Bracelets are ornamental jewelry pieces that enhance the aesthetic appeal of the wrists and hands. Construction materials vary, but the prevailing ones includes metal, leather, cloth, and plastic together with embellishments such as jewels, rocks, wood, shells, and crystals. The history of the bracelet is a largely debated topic. However, archeological discoveries have given us some clues regarding the earliest forms of bracelets. The wearing of jewelry for adornment and ritual started as far back as 7,000 years ago based on archeological findings in ancient Egypt, Mesopotamia, and China. Early bracelets featured grasses, slender tree limbs, and shells, before transitioning to copper and bronze. By the time of the First Dynasty (2680 B.C. ), Egyptians wore bracelets made of gold and silver, decorated with semiprecious stones. Skilled goldsmiths of the New Kingdom (1558 to 1085 B.C.) constructed inlaid designs made of African gemstones. Greek soldiers used wide leather and metal cuffs as part of their dress. Well-dressed Romans adopted the idea of cuffs into coiled gold bangles that resembled snakes. Mediterranean jewelry spread across Europe, but bracelets fell out of favor, especially among men, as Europe transitioned to the Middle Ages (A.D. 476 to 1450). Artisan cuffs and bangles carved from jade, gold, and other metals existed in China as early as 2000 B.C. The ancient Chinese valued gold bracelets etched with elaborate patterns of nature, animals, and mythical creatures. European women rejuvenated the use of bracelets as an everyday fashion accessory in the 17th century. They wore several ribbons and thin bangles at a time. Bracelets became more affordable as mass production of fashion jewelry boomed. By the 1920s, the ornate designs of the late 19th century gave way to the clean lines of the Art Deco period. Designers added Bakelite and plastics to jewelry in the 1930s. Silver became the most common material for bracelets, cuffs, and bangles thanks to the mass production of silver jewelry, which was less expensive than gold but still had that precious metal appeal. Today, it is hard to locate fine jewelry bracelets because most manufacturers use cheaper materials. At GraciousRose.com, you can choose from over 3,500 authentic gold, diamond, silver, gemstone, and platinum bracelets. Even if nothing catches your eye, custom-made pieces are available! Bracelets are widely available, but quality is often an issue. Thankfully, there is Gracious Rose, delivering top quality jewelry products right to your doorstep! Few people can tell high-quality jewelry from cheap knockoffs, so many folks end up paying more for less. Whether you need gold, platinum, or silver bracelets, Gracious Rose has you covered. With over a decade of experience producing exquisite jewelry pieces, we offer only the best! Show your appreciation for someone you care about with a gold bracelet today. Find the perfect bracelet at GraciousRose.com now!